Earlier this year, I wrote an article about designing blogs for readers. I still think it’s good advice. Since then, though, I had started to allow some cruft to creep into my blog design again: a few more items in article headings, for example. I’ve now made a few tweaks to redress the balance, and had another think about my goals for this site. Self-evidently, I’ve removed the rarely-used and hideous “Send to Kindle” button from the header (it’s now in the footer, and may go away entirely). I’ve done the same with my Author Marks toggle, which only shows up for appropriate articles. I created Marks to give an indication of which sections I felt were most important or quotable, and now I’m wondering if there’s maybe something a bit heavy-handed about them; like leading the reader (beyond the usual leading that word-choice and phrasing will naturally cause). I’ve noticed a huge correlation between the Marks and quoted extracts when articles are shared, and I’m still internally debating whether that’s actually a good thing. I’ve shortened the “reading time” display for articles, taking a cue from Medium, and I’ve backfilled it to older posts. The new layout has more space and a sense of breathing room, but there’s also an obvious addition: prominent social-sharing icons. How evil, you may be thinking. But bear with me. I’ve come to believe there’s a certain inherent tension between serving existing readers, and reaching new ones. I write for myself, of course - and so should you - but I also write to be read. There’s no shame in admitting that. Social sharing is probably the most significant means by which new readers arrive, and people do want to share articles often. I also have a theory that quite a few sharers do so without actually reading the entire piece - often based just on the headline, excerpt, or even the author. I’m not convinced that the end of an article is the only place that those links should be, so I’m experimenting with making them more prominent (but hopefully still readily ignorable). In terms of my readership, the most used sharing services are Twitter, Facebook and Google Plus (really), so I’ve offered those options just under each article’s title. There are some other choices in the footer. If you want to follow me on social media services, here’s Twitter, Facebook, Google Plus, and App.Net. A minor technical note: the social icons are vectors, from a single SVG sprite-sheet positioned via CSS. It’s a nifty trick, and you only need one image for both Retina and older displays. Lastly, and significantly, I’ve altered my article links. 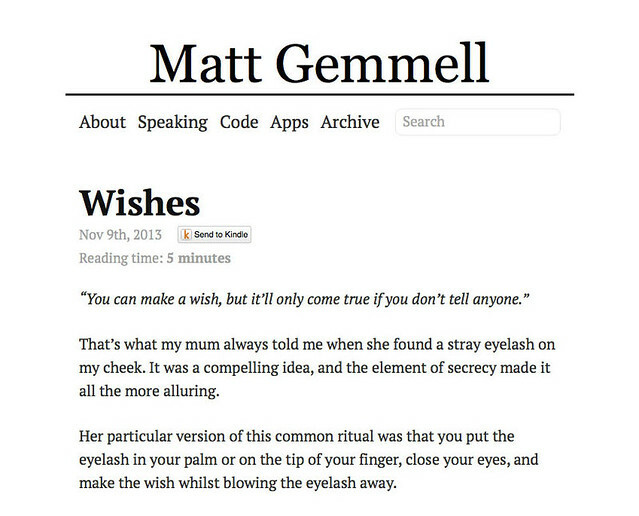 They previously included the date, such as mattgemmell.com/2013/12/09/post-title/, but my pieces aren’t particularly date-sensitive, and it made the URLs ungainly. 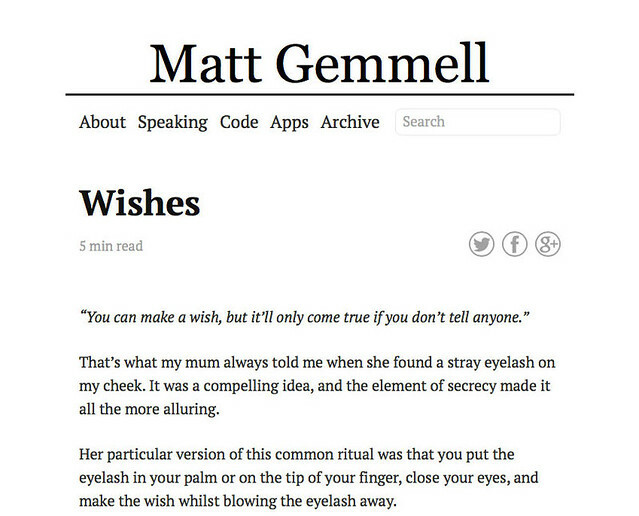 Thus, I’m now using just the post title, such as mattgemmell.com/post-title/. The dates are also gone from the article headings, but remain in the footer. All old links will of course continue to work, and will give a 301 permanent redirection to their new locations. Apologies if your feed-reader reports that old posts are new again. I’m sure they’re worth a re-read. This is my 1,031st post, and can you guess how many duplicate post-titles I had to resolve in order to change the link-structure? Four, each of which had a single duplicate. I don’t think anyone has visited any of those eight pages in years anyway. I plan to continue tweaking. Perhaps the footer will get some attention next time. My two goals for this blog are to facilitate and to drive reading - and those are often contradictory. Measures that bring in new readers tend to irritate existing ones. It’s a fine line to walk, and I acknowledge that. I’m hoping I have some goodwill stored up as I continue to pursue a realistic balance. I think the main value I contribute to the wider community now is in my writing, rather than code or conference appearances, and I’m very happy about that. Correspondingly, I assume that when you visit, you ultimately come here for the words.